Successfully Added Android Tablet PC - Quad-Core CPU, 8GB Internal Storage, 16GB SD Card Slot, 7-Inch LCD, 2000mAh, WiFi, 0.3MP Camera to your Shopping Cart. 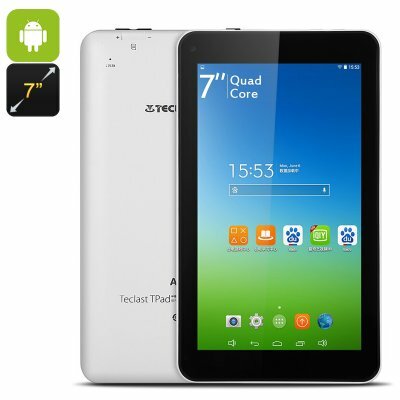 If you are looking for cheap Android tablet PC that meets all your basic demands, this 7-Inch tablet PC is a great choice. For less than 40 Dollars, this Android tablet computer lets you enjoy all the trusted features. You’ll be able to play basic games, browse the web, watch films, and take notes. It features a compact design, making it convenient to carry along in your bag. Thanks to its abundance of entertainment features, this Android tablet is great for keeping yourself or the kids busy during upcoming road trips. The beautiful 7-Inch display of this Android tablet treats you to a 1024x600p resolution. This means that you’ll be able to enjoy nice color and detail while watching your favorite films and series. A Quad-Core processor is in place that lets you tackle basic software features without dropping a frame. Along with its Android OS, it is sure to treat you to a smooth user experience. A 2000mAh battery treats you to enough juice to get through several hours of usage time. To make sure that you can always carry along your favorite media, this Android tablet computer supports 8GB internal storage. In case this is not enough, it lets you slide in a 16GB SD card slot. This provides you with a sufficient amount of storage space to keep all your files and media. Naturally, you’ll also be able to stream films and series straight from the web thanks to its WiFi support. This Android tablet comes with a 12 months warranty, brought to you by the leader in electronic devices as well as wholesale tablets..